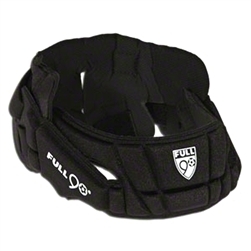 The Full 90 Premier Performance Head Guard is built to defend against hard surface impacts, and has been proven to reduce the probability of a concussion by over 50%. It is lightweight, ventilated, and constructed of dual-density Forcebloc™ foam to protect the crucial impact zones at the forehead and temple. The new Premier model represents the latest advancements in Performance Protection Technology™ and Tru-Play™ design. It is based on feedback from professional players and their use under real game conditions. This is the cutting edge of headguard technology and is ideal for those athletes who play full out, even at the highest levels of the game. Protection Full90 Performance Headguard™ protects a two inch section around the head (which includes the forehead and temples), that receives 80% of concussive head impacts. Within this crucial zone our revolutionary ForceBloc™ foam reduces impact force by up to 50%, meaning fewer concussions overall and areduction of severity of injury. In fact, a recent study found that college players NOT wearing a Full90 Performance Headguard™ were 2.65 times more likely to receive a concussion than players that did. Performance But superior protection is only half the story. Full90 Performance Headguard™ also utilize the patented Tru-Play Design™ which combines advanced ergonomic engineering with applied biomechanics research to ensure that the headguard conforms naturally to the players head for the ultimate fit. By ensuring an optimal fit our headguards never alter a player's style of play or the "ball feel". A Winning Combination This dual distinction of protection and performance gives Full90 headguards their edge and explains why we protect athletes of all ages and all abilities around the world. TruPlay Technology™ All Full90 products are designed using patented TruPlay Technolgy™, a development process which combines applied physics, engineering and design with a deep appreciation for the heart and soul of an athlete, as well as an absolute respect for the game they play. For instance, the Full90 Performance Headguard doesn't alter the way it feels to head the ball but yet its coverage of critical impact zones significantly reduces the risk of concussion. Another example is the HINGE feature of our shinguard, the first of its kind. It seems so simple, the human shin can be quite sharp or very rounded yet shinguards have always been the same shape. Our HINGE conforms to the unique shape of every shin and is a breakthrough in shinguard design. ForceBloc Foam™ ForceBloc Foam™ is an ultra-lightweight cross-linked, high density foam made of polyethylene. This state of the art foam is used in all of our headguards and goalie pads. Tests show ForceBloc foam reduces impact force by up to 50%. Perhaps its most impressive application of ForceBloc Foam™ is in our Full90 Performance Headguards. There are many types of hard surface impacts that occur in soccer such as; head to head, head to ground, head knee, or head to goalpost. The linear or rotational acceleration of these types of impact forces to a player's head can be devastating. Reducing impact forces by up to 50% can mean a drastic reduction in the chances of sustaining a concussion. ForceBloc Foam™ also has a unique property which allows it to not affect a player’s ability to head the ball. Studies show that at the relatively low speed of ball impacts (compared to those of hard surface concussive impacts) there is no greater absorption of force, and ball rebound speeds remain similar to those off of a bare head. COOLMAX® Moisture Management System COOLMAX® fabric is designed to move moisture away from the body and enhance fabric drying rate thus, keeping you feeling cool and dry. COOLMAX® fabric delivers performance and comfort through the use of proprietary polyester fibers with unique engineered microchannel cross sections. Ponytail Port The Full90 Premier Headguard has an opening in both of its occipital pads so that you can pull your ponytail through. Since the occipital covers the area most players chose to wear their ponytail, this allows you to wear your hair the way you like it without being hindered by the headguard.